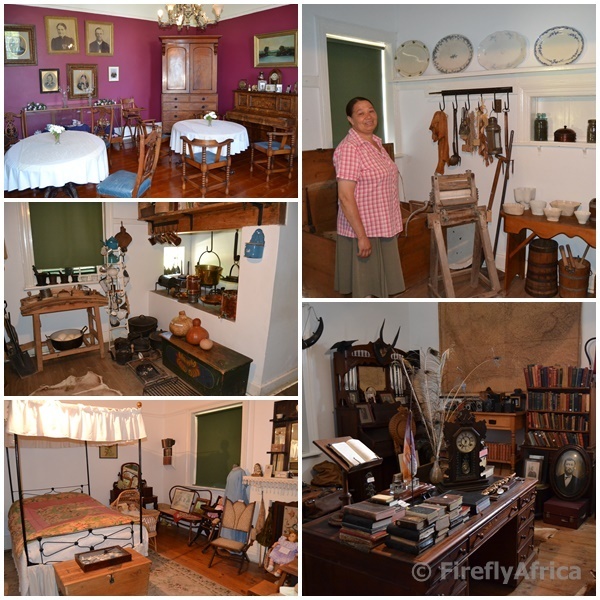 I struggle to pass by a small town museum if I have time on hand and time on hand I had the last time I visited the Karoo Heartland town of Somerset East. I immediately headed up to the Somerset East Museum standing in the shadow of the Boschberg Mountain at the top end of Beaufort Street. I've been here before but it's been a few years so I decided another visit was in order. 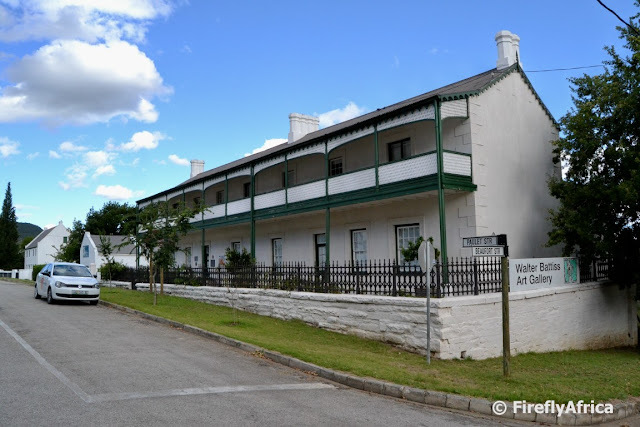 The Somerset East Museum is also known as the Old Parsonage Museum as the building used to be the parsonage for the local NG Kerk. 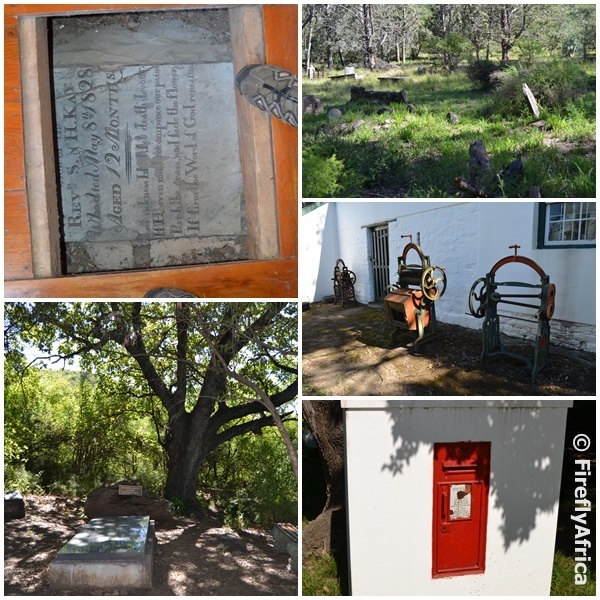 Shortly after Somerset East was establishment in 1825, land on the slopes of the Boschberg Mountain was given to the Wesleyan missionaries for a chapel and graveyard. 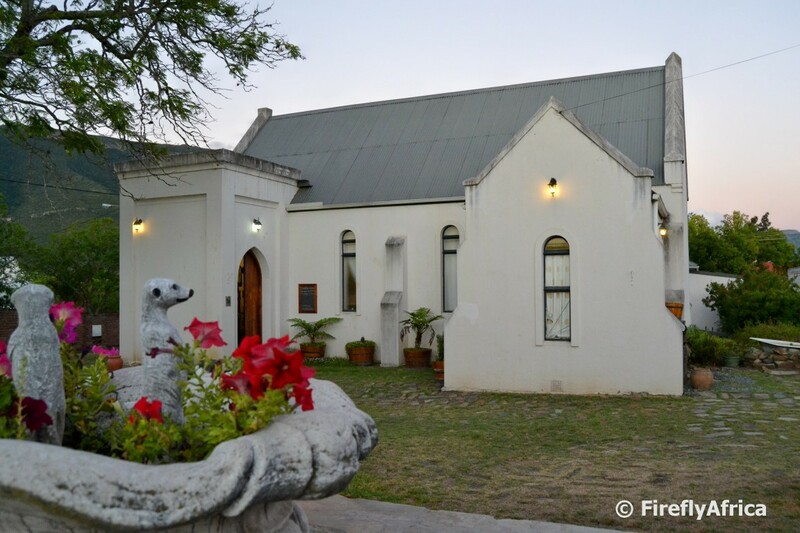 The chapel was completed and consecrated in 1828, but a few years later the building and surrounding land were transferred to the Dutch Reformed Church. In 1835 the chapel was converted into a parsonage and it was used as such for the next 105 years. In 1971 the building was made available as a museum and opened in 1975 when the town celebrated its 150th anniversary. I was met at the door by Keridwyn Frieslaar who has worked at the museum for over 20 years. She took me on a tour of the old house which has been laid out and furnished as it would have been back in the 1800's. The museum doesn't just have a very impressive collection of furniture and artifacts, it also has, or so they say, two ghosts. The first is said to be a Dominee (minister) and a number of people have reported seeing him sit behind the desk in the study. I did check the photo (in the collage above) but there is no sign of him. The second ghost belongs to a little boy who has been seen running around or just standing in a corner with a sad expression. Keridwyn showed me a gravestone under the floorboards in the lounge that belong the the infant son of a Pastor that was buried there (in the collage below). Him I also didn't see. I'll just say that I wouldn't want to spend a night in this building if I was given a choice. The museum's exhibit isn't just confined to the inside of the building. Around the building there are a number of interesting objects and sights (and sites). Behind the museum is an old Settlers grave yard with graves dating back to the early 1800's while down a path on the right of the building is the grave of Ma'Dora. Dora Jacobs died at the age of 122 and was unofficially the oldest person in the world at the time. The Guinness Book of World Records never recognised her as the oldest person because three authenticated documents were required as proof of age. Not something that was easy to come by when Ma'Dora was born in a village in the Eastern Cape on 6 May1880. The museum has a very informative exhibit about the Slagtersnek Rebellion and hanging (which I posted about recently) in an upstairs room. 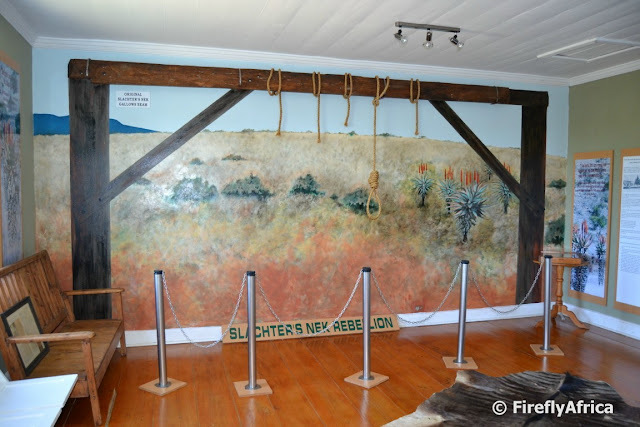 The exhibit contains the original beam that was used to hang the five men from in 1816 before it was used as support beam in a pigsty and where it was found in the 1940's. I had a look at the visitors' book when I signed it and it is sad to see how few people actually visit this magnificent museum. It is essential that everybody in the town promote the museum, especially the guesthouses and B&B's. Between this museum and the Walter Battiss Art Museum, Somerset East really has something for every history buff and culture vulture (and those who don't see themselves as such) that visit and there really shouldn't be an excuse not to pop in with at least one of the two if you have some time on hand as I did. On my next visit back in town I may just come a ghost hunting. Now where did I leave my Electro-magnetic field detector? 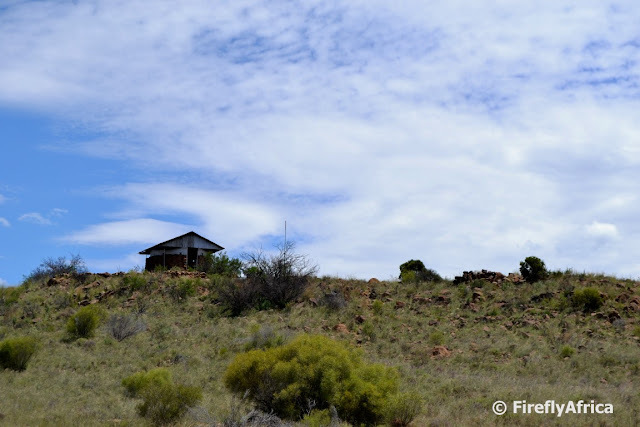 About 35 clicks north of the Gariep Dam just off the N1 towards Bloemfontein stand a blockhouse looking out over the surrounding landscape. Most passing motorists probably don't even notice it but the fact that there is a Geocache located there has put it on my radar. On the previous two road trips north I just looked up at it in passing, but on my last trip to Johannesburg I decided to pull over and make my way up for a closer look. 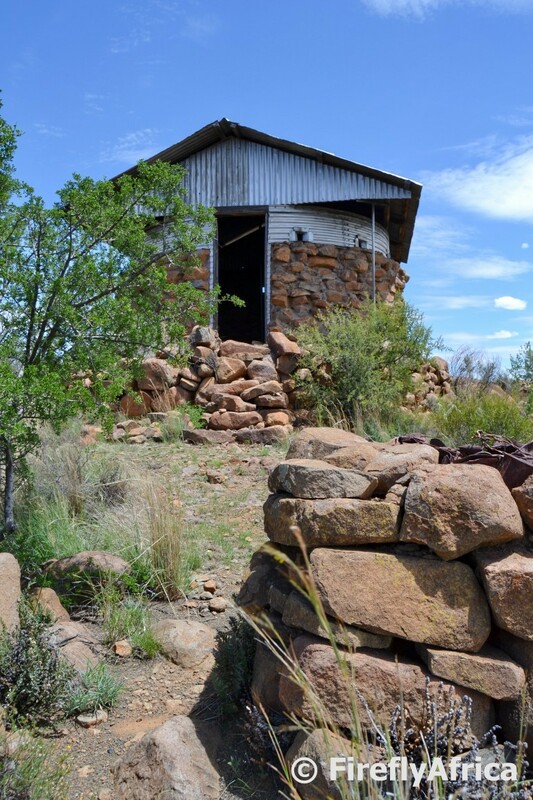 The blockhouse is located near the town of Springfontein and dates back to the Anglo Boer War (1899 - 1902). 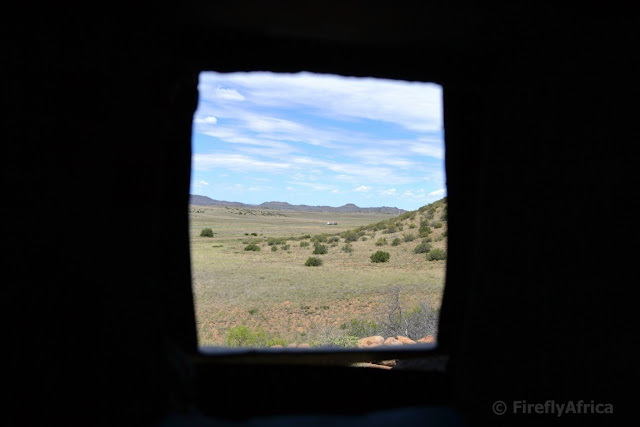 It was used by the British to keep an eye out for advancing Boer forces. This was one of about 8 000 such blockhouses built around the country during the war. A blockhouse such as this would have had seven soldiers stationed there for periods of about three months at a time. As nothing happened most days it would probably have been a very boring job being based there. Springfontein played a very big role in the war. It was the site of the largest field hospital in the southern hemisphere as well as a concentration camp that held nearly 3000 Boer women and children. Its also where the railway lines from Cape Town, Port Elizabeth and East London came together and thus of vital strategic importance. I didn't have a lot of time to spend there that day as I still had a long drive ahead, but I can imagine that just sitting there in silence taking in the view and the environment would be a relaxing experience on its own. Perhaps propping one self up against the stone wall in the shade with a good book is just what the doctor ordered. Just not in the middle of summer. The Karoo Heartland town of Somerset East is a place full of interesting and quirky attractions. One of them is the Walter Battiss Art Gallery which also houses the local tourism information office. Battiss (6 January 1906 – 20 August 1982) was generally considered to be the foremost South African abstract painter but is probably equally as famous as the creator of the quirky Fook Island. Fook Island was Battiss' "island of the imagination" for which he created a map, imaginary people, plants, animals, a history as well as a set of postage stamps, currency, passports and driver's licences. He also created a Fookian language with a full alphabet. Apparently Battiss, or "King Ferd the Third", even traveled internationally using his Fookian passport. You will have to make a little pilgrimage to Fook Island... I mean Somerset East, to see if you can perhaps find some signs of this place of wonder. Naval Hill in Bloemfontein has always been a beacon in the Free State capitol and known for the magnificent views of the surrounding city. 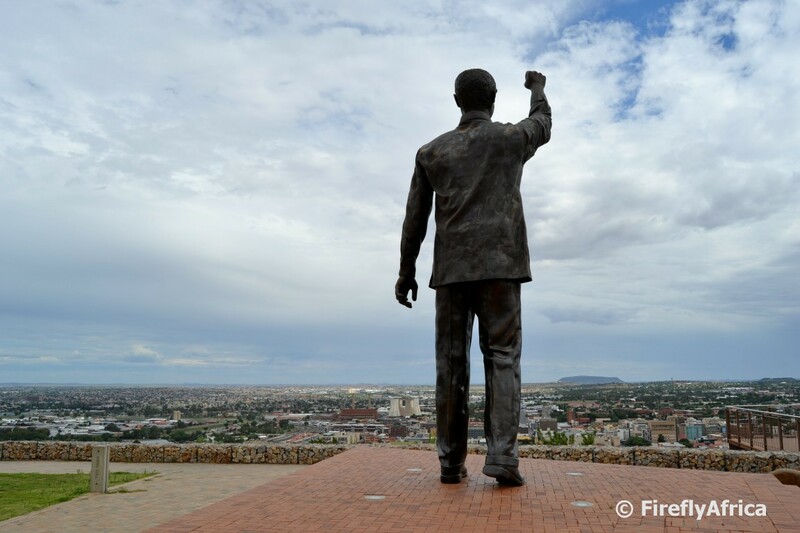 In 2012 an eight meter tall bronze sculpture, made by the same sculptor as the one standing in Mandela Square in Sandton, was revealed. Last year during the #MeetSouthAfrica bloggers trip before Indaba, the one group spent a night in Bloem and visited Naval Hill at sunset. The pictures they posted were stunning. 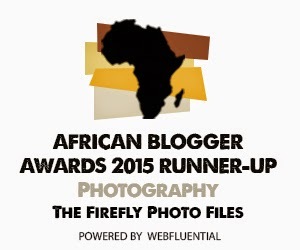 I also got to spend a night in Bloem on my way to Jozi earlier in the year and wanted to do the same. Unfortunately it was cloudy which meant the sunset wasn't going to be as spectacular and I decided not to stick around, but sharing the view with Madiba was still special. Three Karoo Heartland icons, all in one picture. 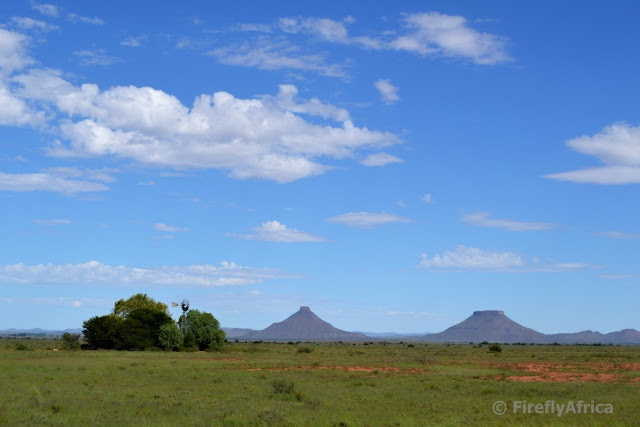 Big open sky, Karoo koppies (in this case Koffiebus and Teebus outside Steynsburg) and the good ol' reliable Windpomp. I have come to love the wide open spaces of the Karoo Heartland in the Eastern Cape but just haven't been able to get used to the, what we call in Afrikaans, Vrystaatse vlaktes. 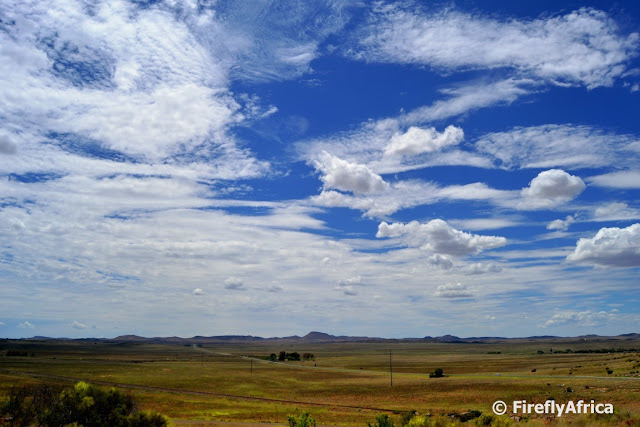 Vrystaat is the Afrikaans name for the Free State, South Africa's central province while vlaktes is an very descriptive Afrikaans work for wide open spaces stretching for miles. The wide open spaces, or vlaktes, of the Free State is very different from that of the Karoo Heartland. Driving along the roads of the central and southern Free State you often feel like you are in the middle of nowhere where nothing grows about knee high. I'm not insulting the Free State, please don't get me wrong. I'm just saying that, like with wine, I just haven't been able to get used to it. I found the most beautiful Afrikaans poem called the Vrystaatse Vlaktes in die Somer just to make up for it in case somebody feels insulted. The picture was taken just off the N1 in the southern Free State about 50 kilometers north of the Gariep Dam. I haven't participated in Skywatch Friday for a very long time and I think it's time I start sharing our beautiful South African skies on a regular basis on it again. 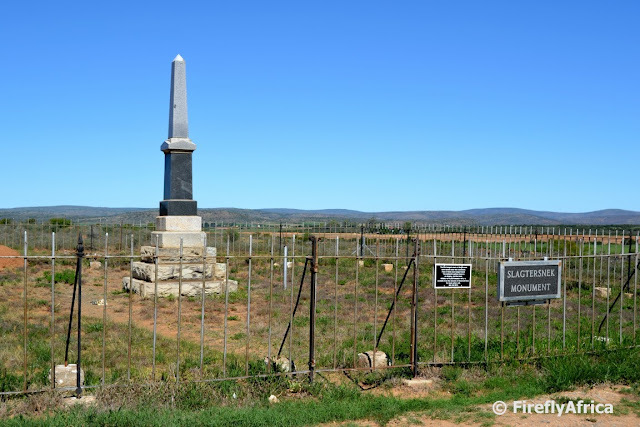 If you are flying along in a northerly direction through the Karoo Heartland on the N10, the main drag between Port Elizabeth and Cradock, do slow down a bit after you pass the first turnoff to Somerset East and keep a look out on the right hand side of the road for a cenotaph like monument. Once spotted, do pull over and have a look as this is a very significant spot in the early history of the area. 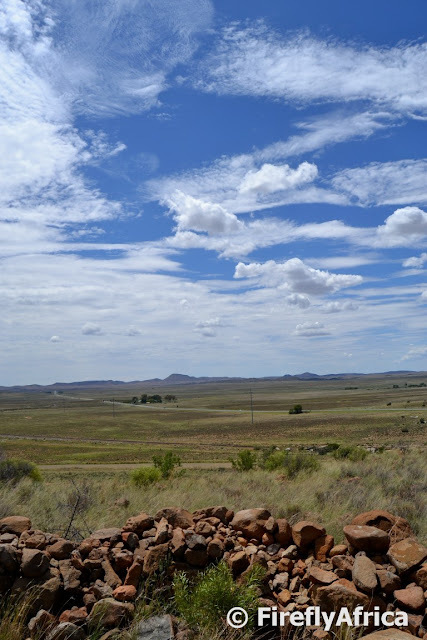 I'm not going to relate the whole story here, but you can go and read the whole article about Slachter's Nek on the Somerset East website. In short, the story is about a violent Boer uprising in the area late in 1815. After most of those involved either surrendered or were arrested, they were charged and either cleared, imprisoned or banished. Five were sentenced to death by public hanging at Van Aardtspos on 9 March 1816. The hangman never realised that there were five to be hanged so old rope was used. 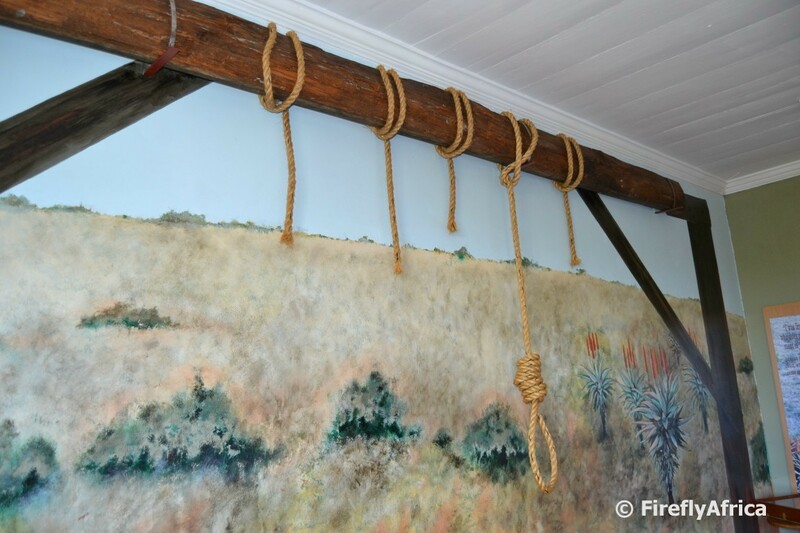 Four of the five ropes broke and Landdrost Jacob Culyer (of the Uitenhage district) ordered that they be hanged a second time, this time one by one. 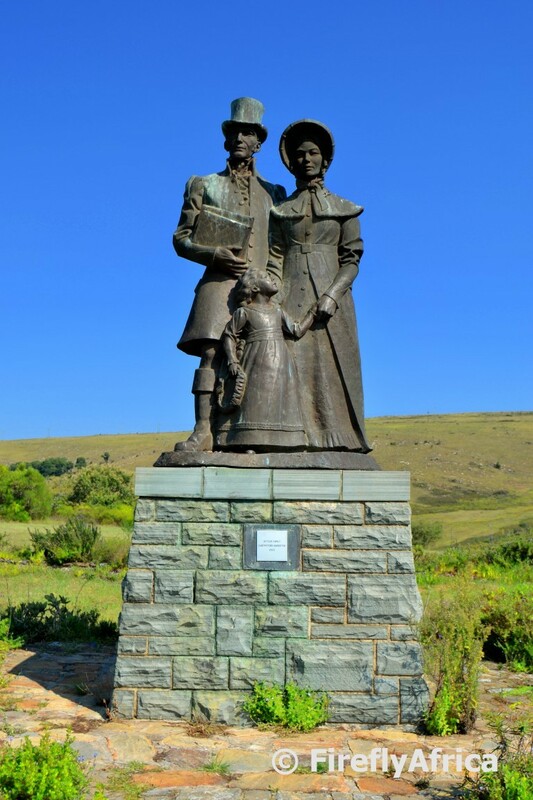 The monument contains the names of the five that was hanged as well as the Bezuidenhout brothers, who were whole reason the uprising started. Another interesting link to Slagternek can be found in the Somerset East Museum in town. The original beam that was used for the hanging is on display in one of the upstairs rooms. After the hanging the beam was used as a support beam in a farmer's pigsty where it was found in the late 1940's and taken to the Voortrekker Monument. In 1989 it landed up in the Cape Town Historical Museum before it was eventually returned to Somerset East. 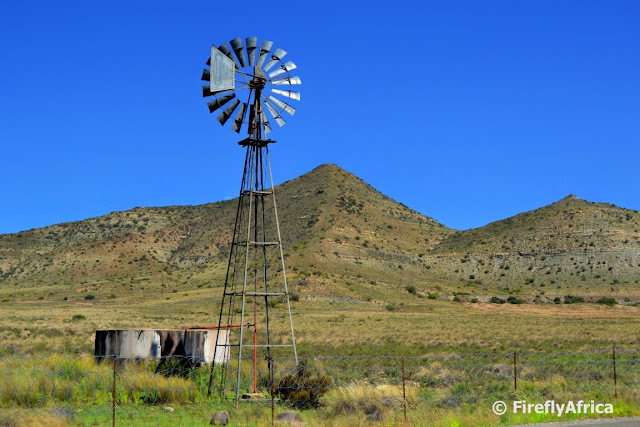 The windpomp is one of the icons of the Karoo Heartland and as part of the landscape as Karoo koppies, sheep and Angora goats and a good ol' farm gate. But have you ever wondered where the windpomp came from and how long they've been around? The first windpumps were used to pump water since at least the 9th century in what is now Afghanistan, Iran and Pakistan. They later became widespread across the Muslim world and also spread to China and India. From the Middle Ages onward windmills were used extensively in Europe, particularly in the Netherlands and parts of Great Britain, to drain land for agricultural or building purposes. Records show that windpompe were used in South Africa from 1869, although the earliest evidence of a windpump in the country comes from a painting drawn in 1848. These first South African windpompe were all wooden constructions with the first all steel windpump being patented in England in 1855. The first imported windpomp came to South Africa in 1874 and was a Standard Halliday that was erected on the farm of Mr P.J. du Toit in the Hopetown District. The windpomp in the picture stands next to the road between Cradock and Middelburg in the Eastern Cape. I'm not much of a drinker preferring to do the sacrilegious thing of making beer shandy by throwing lemonade into a perfectly good beer. But I am known to enjoy a good beer or wine tasting so it shouldn't come as a huge surprise that I'm doing a post on a place where you can do a spot of whiskey tasting. As long as I only need to taste. But this isn't sommer any place, it's a whiskey bar inside a church and can be found at Angler and Antelope Guesthouse in the Karoo Heartland town of Somerset East. The church building is the town's original Roman Catholic church building and was built in 1906. Named after St Francis of Assisi, the patron saint of animals, the church was built with funds raised by local Catholics and aided by contributions from the Catholic Diocese of Port Elizabeth. 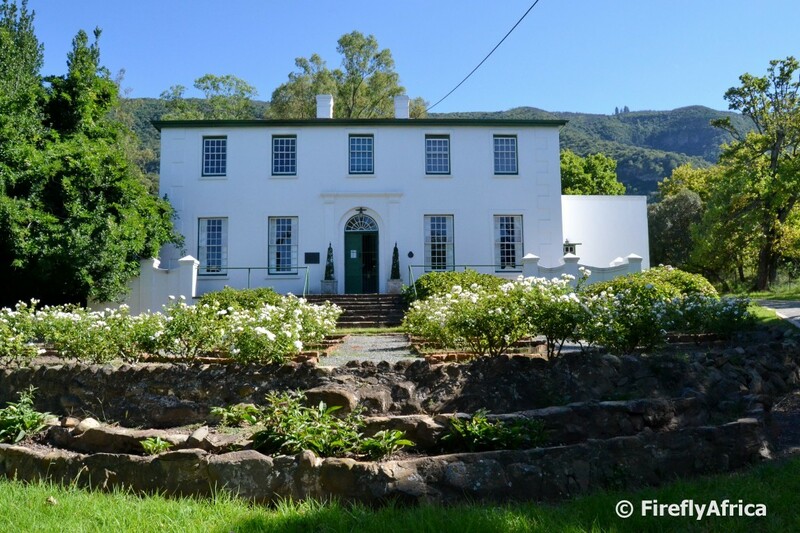 The presbytery next to the church was built for the first priest of the congregation in 1925 and is used as the guesthouse's family cottage today. The last Roman Catholic priest to serve in St Francis was Father Michael Scully. He used to ride around town on his bicycle and was always willing to help others, especially if you happened to have a spot of Irish Whiskey in the house. I'm sure if Father Scully was still around he would give the pub with its collection of over sixty malt whiskeys his blessing. The pub isn't open to the public so if you want to try it out you will have to book into Angler and Antelope or at least make a special arrangement with owner Alan Hobson. Just for interest sake, Father Scully grew his congregation in Somerset East during his time here to such an extent, that they outgrew the little church of St Francis. A second church was built in Paulet Street, but this soon became too small as well. The new Roman Catholic Church in Beaufort Street was built, but sadly Father Scully died in February 1997 at the ripe old age of 80, and did not see its completion. 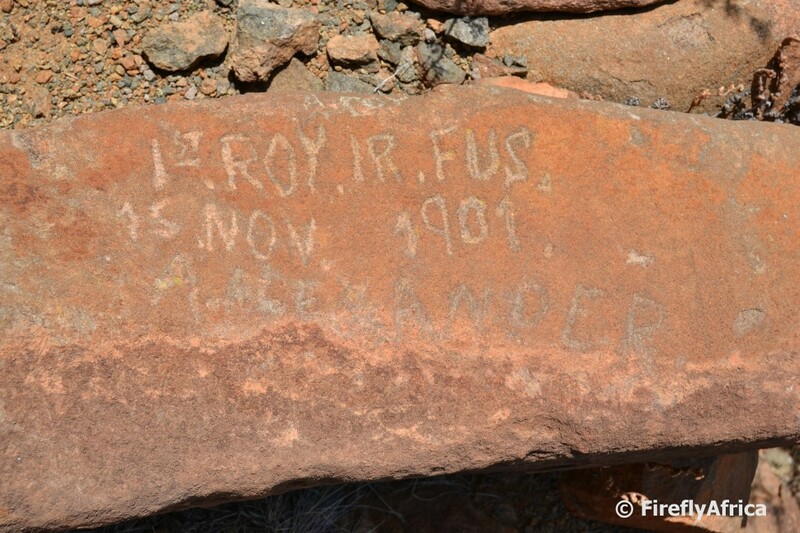 Thanks to Angler and Antelope for the historic information added to this post. 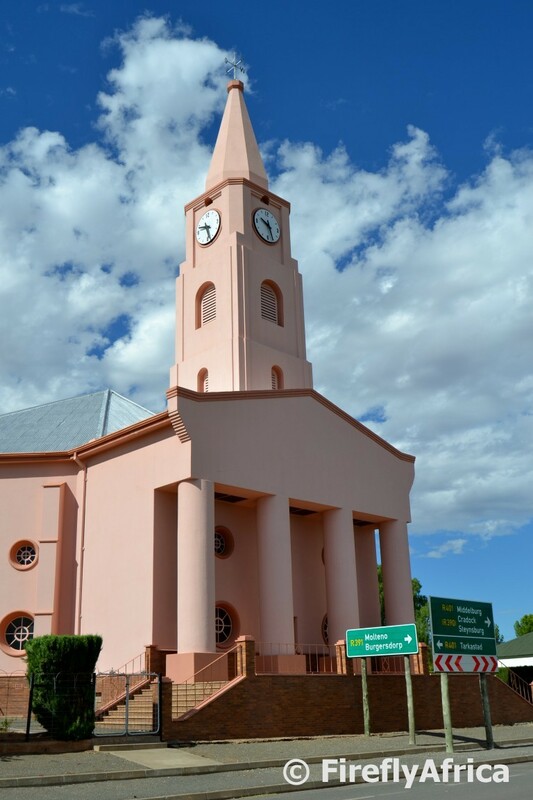 Most Karoo towns have a historic church with a church tower that keeps an eye out over it. The Karoo Heartland town of Hofmeyr is no different... or perhaps it is. Why? Because it has a pink church tower standing out above the town. The Dutch Reformed Church in Hofmeyr was built in 1875 and at some stage went pink. It definitely didn't go pink for breast cancer awareness because it happened way before that but whatever the reason it looks very cool.